I have been writing this now for eight years charting the progress of the band. I intend to keep this page as simple as possible and just add news to it as it happens. Latest News on the top of course. Another six months have wound through the tape head of life and now we find ourselves in 2018 so, in time honoured and time related fashion I wish you all a Happy New Year and hope that the blight of factious politics does not bring hardship to your door. Sales of the 'solo' album have been steady - maybe not enough to purchase the mansion in the country or the limo but give me art over money every time (I keep telling myself). There has been the usual hiatus in production after releasing an album but the ideas are all coalescing possibly around a new band and a new band album. It is never easy to carve out a new band and the fruits of any collaboration maybe not be apparent in the near future but the seeds are there. 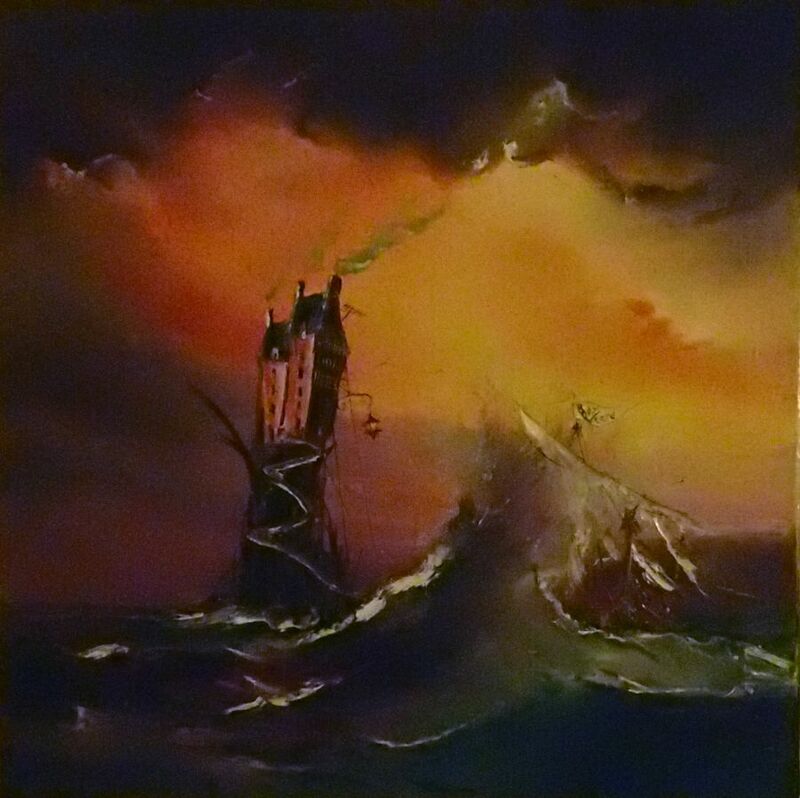 I would still like to put out more than one album with each line up (four albums - one each from Dogwatch, Roy Weard and Last Post, That Legendary Wooden Lion and the solo Roy Weard one - not to mention the bootlegged original Wooden Lion album) and I have been somewhat inspired recently by this wonderful painting by Serge Doceul. This is just crying out to be an album cover so maybe we should write and record some more That Legenday Wooden Lion songs. If you look closely at the painting you can see it says 'Wooden Lion Hotel' on the tower. Hard to make out on here. The book, 'The Way To(o) Weard' has also had some good comments and reviews and continues to sell. Not much to report at this stage of the year but there will be more later - I promise you. The new 'solo' album has been out for a while now and has received a good reception. There is a nice review up on the Divide and Conquer website and I will post more when they come up. The album is available from either Wooden Lion shop or my own website or from Bandcamp . It is also on sale at Resident Records in Brighton. Roy will be rejoining his former bandmates for a That Legendary Wooden Lion / Enemy of The Lion show at the Bandstand in Victoria Park, Hackney on Sunday 25th June. The will be on stage at 1:00pm. This is a free gig so come along and join us there. This is the Facebook event page. He will also be travelling up to appear at the Blind Cat Festival in Lincolnshire. between 11-13 August with some of the band from the line-up that appeared with him at the Prince Albert in Brighton for the launch of the CD. There are also some plans to record a live album for That Legendary Wooden Lion. Details on that will follow but we are hoping to do at least two shows, one in London and one in Brighton. The album is available from either Wooden Lion website shop or my own or from Bandcamp . The new album is on the starting block. After, what seemed like an age of recording, mixing and all the things that go along with the process of making a new album, it is finally out of my hands and should arrive here in time for next week's release date and launch gig. Making an album is always a journey and, at the start, I was almost convinced it would not get made. Recording began with the intention of making this a new 'That Legendary Wooden Lion' album and some of the songs on it were part of the repertoire of the Brighton band for a while but, soon after the beginning of the recording process, the guitarist and drummer both departed and we had to stop. At this point I was in the process of recording an album for Brighton band 'Dirty Weekend' and so I asked the guitarist if he would like to play on a couple of my tracks. he agreed and brought with him Simon Young to play drums. Pretty soon we had three tracks down and the journey had begun. One of the planned tracks, 'Drugged', had come into being during a session with guitar supremo Gav Cantrell and the rhythms on that were screaming out for the drum talents of Damo Waters so I persuaded him to take some time off from working with Clowwns / Brother Twain / Zofff / Field Music / Slug / Crayloa Lectern and many other bands who were clamoring for his talent. We convened in the studio with Gav on guitar and Andy Power on bass and laid down a searing backing track. Damo went on to play on two more tracks on the album. Two of the tracks on the album, 'Life's All Surprise' and 'Losing Your Grip' arose from just an acoustic guitar part by me. These two were not played by the live band and were just sketches I recorded to play to whatever the band was going to be. I went into the studio a few more times and started adding more to them and eventually they developed into the tracks that are now on the album. 'Losing Your Grip' was probably the longest in gestation. The original track was a couple of layers of acoustic guitar and one of treated electric guitar but then I bought a Mel9 - the melotron emulation pedal. I added some more guitar parts using the lush string and choir sounds the pedal gives you but I was still not happy with it. Andy played some bass and John Dowle added a short guitar solo but it needed more. I spoke with the avant garde artist TyLean, for whom I had recorded a live album a few years back, and asked her if she wanted to add to it. I sent the track to her in Spain, where she lives these days, and she returned it with layers of wonderful vocals. The whole track had changed direction. I played the track to Gregg McKella from the band Paradise 9 and he offered to come in and add some 'gliss' guitar and clarinet. After that it was a whole different beast. John Trelawney - former Dogwatch trumpet player and violinist came in to play on two other tracks with Marcus Weeks (trombone) and they decided to play on the track too. The final icing was applied by Nick Pynn who layered acoustic viola parts over it. At every stage in recording this song the musicians I invited in said 'I don't know what to play on this...' and then went on to to add something special - apt for a track called 'Losing Your Grip' I feel. Life's All Surprise was written after I heard a radio programme about a man who could only recall short term memories laid down in the previous five minutes. I put the initial guitar parts down with an Ovation acoustic that I had refurbished and set up for my daughter - I was in the process of writing the song and wanted to test the guitar out in the studio. The Mel 9 came into play again for this and after a couple more layers of guitar I was quite pleased with it but it needed bass. I had a bass guitar at home that my daughter, Pixie, had played so I went home and got it - and laid down my first ever bass guitar track. Damo came in and played drums, my wife, Saskia Wesnigk-Wood, added piano and then Nick Pynn played a spooky singing saw track to complete it. The album closes with 'This House (rests)', a track which grew and grew during the recording. It features the core band of Andy Power / Cliff Dowding /Joe Colburn / Simon Young / and myself. Nick Pynn plays acoustic violin, viola and mandocello, Gregg McKella plays carinet, John Trelawney plays violin and cornet and Marcus Weeks plays trombone - a veritable orchestra! I also had the services of Bill Smith and Adam Barrett providing bass vocals at the start. Finally, and I hope you have got this far down this long message, I had the sublime voice of my daughter Pixie Tonks Dhel on 'The Long Wave (goodbye)' and 'The Lights Go Out'. So now the first part of the journey is over and the album is complete and ready to go - we should be shipping orders on the 24th April. 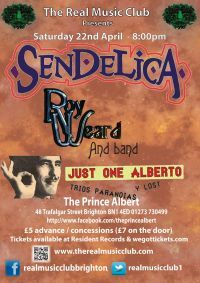 There is a gig at The Prince Albert in Brighton as part of The Real Music Club on the 22nd April and the album should be available for purchase there. The album is also available from either Wooden Lion website shop or my own or, in physical or digital form, from Bandcamp . I hope that you will come along to the gig, buy a copy of the album and enjoy them both. As we dash headlong towards the end of a somewhat timultous year, the fact that I have not put a newsletter out weighs down on me. It is not a lack of activity on my part, although there have been no live band performances. The lack of news has mainly been due to a shifting of my focus towards the new album. As this is approaching completion I suppose I should say a few words about it and how it came about. When I am not making my own music I am often recording other peoples' and that led me into a collaboration with PA Studios in Fishersgate. We converted one of their rehearsal spaces into a small recording studio and, over the last year, we have recorded a couple of whole albums for local bands and odd tracks / overdubs for people like Trim Tab Jim whose album will be released early in 2017. Having a studio available has also been a boost my own creativity. By the middle of the 2015 I had a musical foot in two camps, in that I had the new incarnation of That Legendary Wooden Lion down here in Brighton and was still doing the odd show with the previous line up under the same name. 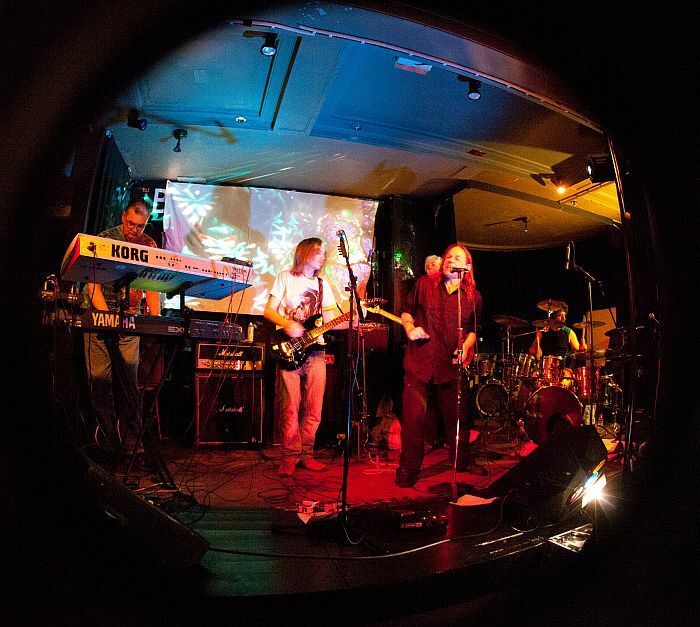 This eventually became an untenable state of affairs and when, in September of 2015, the Brighton band fell apart, shortly before a show at The Prince Albert, the London Band stepped in to perform alongside Brighton cult act Clowwns. The fact that I was involved with two bands with the same name but different line ups was decidedly confusing and needed to be resolved. I had written a lot of new songs that had been part of the Brighton band's repertoire so I started to work on trying to record these. I had the core support of Cliff Dowding on keyboards and electronics and Andy Power on bass but we needed a drummer and guitarist. Joe Colbourn, guitarist from Brighton's 'Dirty Weekend', stepped in and offered to play and Simon Young, drummer from the recently disbanded 'Jealous Michael' completed the first sessions. Gradually, during this last year, I have been enticing others in to play and the album has been developing in true hybrid style. Damo Waters, probably the most 'in demand' drummer in Brighton is on three tracks. One of these is 'Drugged' which also features Gav Cantrell on guitar and will, all things going to plan, feature John Trelawny on violin and trumpet (maybe some other brass too) and Marcus Weeks on Trombone. Nick Pynn, who is currently on tour with Richard Durannte willl also be adding his sparkle to some of the tracks in the New Year. Among those with contributions already recorded are Gregg McKella on clarinet and gliss guitar and some stunning vocals from the avant guard master singer Tylean. One of the highlights of these recordings has also been having my daughter Pixie on backing vocals for a couple of tracks. Andy and I were in the studio last week, mixing some of the completed tracks, and we are both really happy with what we have so far. I hope to be able to get the album out early next year. It will be called 'This House In Amber'. More information to follow. There will be a new band forming in the New Year. I will let you know more about this, and what it will be called, when it happens. That Legendary Wooden Lion will be doing a one off show in London at Leytonstone's Sinbin at The Plough & Harrow, 419 High Road Leytonstone, E11 4JU, on 4th February alongside The Enemy Of The Lion. There may also be another Victoria Park Show in the summer. The book, 'The Way To(o) Weard' has been selling well. It is available from this website. All in all it has been an interesting year musically even though it was a depressing one politically. I wish you all well for 2017. I apologise for not getting onto these on a more regular basis. There were no gigs to mention but there has been a degree of activity over the last couple of months that needs to be reported. On the band front there have been a few a few developments. Firstly we have a new drummer. John Issacs (former drummer with Alternative TV) has replaced Joshua Simpson and we have started rehearing together. The new line up for That Legendary Wooden Lion will be supporting Clowwns at The Prince Albert in Brighton on Friday 25th September for the Real Music Club. I hope to be able to add a few more dates in after that. We have also made a start on tracks for the next album. More news on that as it happens - at the moment it is a work in progress although most of the songs are now written. Finally I am doing a few shows with my former bandmates who currently go under the name of The Enemy Of The Lion. The Puckwick Hotel, 246 Woolwich Road, Charlton, London SE7 7QU on Saturday 31st October - Halloween even! The book is now out and I will be doing a book signing event in Cambridge on Saturday 18th April at Heffers bookshop as part of their 'Vinyl Day'. The address is 20 Trinity St, Cambridge CB2 1TY. I should be there from 10 am and I hope to have new 7" vinyl singles from the Roy Weard and Last Post era for sale.. The new line up of That Legendary Wooden Lion made its debut appearance at the Brunswick in Hove last week for the Brighton Book Launch. Not only did we have the first appearance of John Dowle on guitar but we now also had Pixie Tonks Dhel on backing vocals. We are currently looking into more gigs with this line up. I will, however, be doing sporadic shows with my former band mates including one in Victoria Park, London on the 14th June. The London Book Launch at the Dagenham Roundhouse went very well and we featured many of the songs from the CD, 'Writing In A Skeleton Key' as well as a few from The Last Post. The former members of That Legendary Wooden Lion, Steve Bensusan, The Cardinal Biggles, Chris Mott and Chris Cottage played a storm. They now do gigs as 'The Enemy Of The Lion' and both opened and closed the evening. The evening was notable also for two special guest appearances by Tony Morley(bass, 12 string acoustic guitar, drums and vocals), Linda Kelsey Foster (keyboards) and Roger Glynn (guitar, vocals) who had all been part of Dogwatch. They performed on 'On The Blink', 'Man In A Cage' and the Dogwatch Classic 'Ice Cream Man'. Tony also played on 'Blank Moments'. You can buy the CD and the Book on the Wooden Lion website shop. We are getting closer to the launch date for the book, ‘The Way To(o) Weard. The launch of the book will be accompanied by two gigs, one in Brighton and one in London. The London one will feature my former band mates, Steve Bensusan, The Cardinal Biggles, Chris Cottage and Chris Mott who, together with Dave Munday, will be performing a couple of sets as ‘The Enemy of the Lion’ and, between these , I will be joining them for a set of songs from TLWL and, Last Post and Dogwatch songs. Some old Dogwatch and Last Post members said they would be there too. The Brighton show will have music by The Deux Johns Orchestra, (http://www.deuxjohnsorchestra.com/) a jazz band formed by Dogwatch trumpet and violin player John Trelawney. The current line up of That Legendary Wooden Lion (Joshua Simpson, drums / John Dowle, guitars, / Andy Power, bass / Cliff Dowding, Keyboards) will play a set too featuring some of the new songs we hope to record for the new album this year. This will be at The Brunswick, 1-3 Holland Road, Hove BN3 1JF on 5th April at 8pm Admission for this one is £3.00 but that is refundable against the cost of a book. Other news is somewhat frustrating. I was pointed by Ken Anstead to the release of a CD on the audio archives label. This is a copy of the original Wooden Lion’s aborted first album in 1973. The company somehow managed to get hold of a copy of the acetate and my hand written lyrics. They then blatantly stole photographs from our website and produced the CD. Another compilation CD on their label also features a track from it. This is a completely unauthorised release and we get no money from it at all. I have included it on our website discography for the sake of completeness but it is annoying that it has come out like this. I am taking steps to see what can be done to get some redress from the company but they are very faceless. Anyhow the new Lion moves along and other gigs are being planned. There will be further gigs in Victoria Park in the summer with The Enemy of the Lion too. It seems a year has crept past me and I am ashamed to say I have not updated this blog. I will endeavour to do better this year. I have spent a lot of this year getting my book ready to go to print and that has now pretty much done. The final photographs and revisions are being sent off and we have two book launches planned. The second date will be at the Brunswick in Hove on 5th April. This is the venue I have been involved with for the last two years in my role as part of The Real Music Club team. There will be music there too. The main act will be The Deux Johns Orchestra which features the trumpet and violin of John Trelawney – formerly of Dogwatch. I will be doing a short set of new tunes which I hope to record later this year and which will form the basis of the new album. We have also set up have a Bandcamp site where you can purchase the previous album, ‘Writing In A Skeleton Key’ in both digital and physical formats. You can find details of all of this on the website. Gig details are posted on the Gigs page and on the page dedicated to the book itself. There should also be another outing with the original That Legendary Wooden Lion in Victoria Park in the summer. I will try to post a bit more frequently in the coming year. There will be a lot happening. It is coming up to a year since Gav Cantrell, our guitarist, was whisked off to hospital forcing us to cancel the gig at the Prince Albert. Since then, as I said in a previous blog, he has been in and out of the operating theatre and had several operations. Throughout it all he has remained positive and continued to insist that he will be back with. This is something we all hope for too. In the intervening period we have remained busy, writing songs and playing together, although, without Gav's biting guitar work it has not been easy. Gav suggested we got a replacement in so we could gig but I was against that at first, partly hoping that he would recover quickly, and partly because I liked the direction the new line up had taken. Over the last few months, however, we have been working with a new guitarist, John Dowle, and the last rehearsal really took off. It takes time to slot a new member into an existing line up, time for him to work out the dynamic of the band, and time to learn the tunes. John is fitting in well now and I have hopes of getting to grips with some gigs at some point in the Autumn. I now have enough material written for a new album and I hope to be able to start work on that in the Autumn too. This will feature the current line up with some guest players (maybe even Dogwatch's John Trelawney and Paradise 9's Gregg McKella - both have agreed to play). Lots of work to do before we get to that stage though. In the interim I have now finished my book and it rests with the publishers. I expect to get that out this year and I also hope to be able to do a couple of launch events - one in London and one in Brighton. The band could well perform at these along with some other special guests - more on this when I have a publication date. Since things are moving along a bit now I will post on here on a more regular basis. In the meantime feel free to join my Facebook page or drop me a line via the contact page on this site. It has been a while since the last blog posting up here and I suppose the first few days of a new year is as good a time to kick off as any other. I started 2013 with a good deal of optimism for the new line up. Gav Cantrell's expert and fluid guitar had given flesh to some of the songs I had been toying with since the breakup of the previous band. Not only that but having Joshua Simpson on drums was beginning to make things sound pretty good. We were five songs into having a new album ready to record and the first two gigs with this line up went very well. At the end of July Gav suffered the recurrance of a previous illness which resulted in immediate hospitalisation and a drastic operation. That meant the band had to cancel the supporting slot we had been offered for the launch Paradise 9's latest album and since then everything has been on hold for us. Gav has had three more operations since then and may be due for another one in the near future. Although he suggested we should put in a new guitarist, I decided that I would rather wait until he was well enough to come back. Those of you that have heard the work we have done so far will recognise that he has made a big contribution to the new sound of the band and I know that some of you are still picking your jaws up off the floor after hearing him play. The other four of us have continued to rehearse together and write. I hope there will be a new album and a flurry of gigs in the coming year. There are plans to get some backing tracks down soon. On a different tack I have just written the final chapter of my autobiography. I hope that will be ready to publish soon. In the meantime have a look at the YouTube videos from the new line up and, as always, watch this space. The first gig with the new band has been put to bed and, on the whole, the train wrecks were confined to a relatively minor slippage at the points and leaves on the Harpies Line. Of course my brain decided to throw out some of the lyrics but, all in all, it was a credible outing with over half the set being new songs so we are well on our way to writing the new album. There are some videos up on Youtube and there is now a new page on the website dedicated to the new line up. We have our second gig coming up this month. On 29th May we will be supporting Psychea as part of their short UK tour at The Prince Albert in Brighton. This should be an interesting gig since they have never been out of Russia before and the music is unusual. Well worth checking out if you are in Brighton that night. The new line up for That Legendary Wooden Lion will take to the boards for their first show on the Sunday 28th April as part of a Real Music Club event, The new line up, featuring Gav Cantrell on guitar and vocals, Cliff Dowding on keyboards, Andy Power on bass and Joshua Simpson on drums, has been hard at work rehearsing in Brighton Electric studio for the last three months and the new gig should include four new songs written within the framework of the new band. So, the first show will be at the Brunswick, 1-3 Holland Road, Hove, East Sussex. BN3 1JF. There is always a degree of trepidation when embarking on a new format and this gets heightened when your set is at least half made up of new material but you get a better view from a tightrope. Adrenaline will flow but that is all part of the process. In some ways a step into the unknown is that vital stimulus that has always pushed me forward. I have always been consumed by the need to write in one shape or the other and the different styles that the current line up bring to bear on things have led us in a whole new direction. Old songs have changed shape and new songs seem to both stand out as different whilst still slotting into the set. I am looking forward to stepping back onto a stage again and I hope to see some of you there. In other news, as they say on the BBC, the previous CD, ‘Writing in a Skeleton Key’, is being released in Japan in June and a U.S. release is being negotiated. My book is also nearing completion so there is a lot happening even if it is not so evident from here. Once we have the first show under our belt we will be looking to add some more gigs and to record a new album. As always these things will be reported here and on this website and on our Facebook page. Happy New Year to you all. The hardest thing in band terms is to start from scratch. Put five musicians who have never worked together in a room and try it. It is not easy. Things are now beginning to to take some sort of shape and the form they are taking is, to say the least, interesting. We now have a regular drummer so the line up can be confirmed as Cliff Dowding - keyboards and electronics, Andy Power - bass, Gav Cantrell - guitar, Joshua Simpson - drums and Roy Weard - vocals and guitar. I have always been a reluctant guitarist but I seem to be playing a lot more with this line up. We are still a way away from a live show - lots of edges to be knocked off, surfaces to polish, t's to dot and all that stuff but there is a new bunch of songs bubbling away in there. I will post some music as soon as there is anything sufficient quality to put up. I said in the last post (or was that another band?) that we would not be going out as That Legendary Wooden Lion but it seems I may have to go back on that. the logistics of the Japanese release may mean that we will have to do just that. It will be some sort of relief because band names are probably harder to think up than new members have been. One thing is for sure. The new band will not sound like the old one. Gav's guitar playing owes more to the modern school of 'shredding' and Joshua's drumming is pretty unique. Intrigued? I knew you would be. The world spins on - even after Mayan predictions of Doom - new year, new line up, new songs, news, news, news.